Published in Viator, 2012. Original article here. In a city as rich in monuments and history as Moscow, you may be surprised to find you have to head underground for what is arguably the best attraction of all. The metropolitan public transport system of the Russian capital is one of the busiest in the world, carrying nine million weary commuters between home and work every day. But while doing so, the Moscow metro provides an experience worthy of a Tsar, along with some interesting history lessons told from the viewpoint of a proud empire. Sculptures, frescoes and intricate mosaics might be standard in this vast metro network, but rest assured you will be amazed over and over again as you travel from one spectacular station to the next. 32 colourful glass panels make Novoslobodskaya quite the sight. Brass borders frame the stained glass, lit up from behind in this 1952 station. The central artwork on this Koltsevaya stop is Pavel Korin’s mosaic panel “Peace in the Whole World”; commuters are treated to gold-coloured mosaics making up the Soviet hammer and sickle, in front of which white mosaic doves are released. The State prize of the USSR was awarded to the architects who designed Belorusskaya metro station in 1951. An elegant station with lots of subtle white details, Belorusskaya’s theme is life, culture and economics of Belarus, the Soviet subject which gained independence in 1991. Located on the Zamoskvoretskaya and Koltsevaya lines, the decor is accented by elegant light fittings amongst mostly white marble and glass, with a floor of elaborate red, white and grey ceramic tiles. On the Koltsevaya line, this 1965 station is themed on agriculture around the Soviet Union. The details in the reliefs are offset with gold against white, while marble and granite cover the walls and floors respectively. Like several of Moscow’s metro stations, Prospekt Mira boasts some spectacular light fittings: here chandeliers are made up by cylinders, hence bringing a classic feature up to date with the mid-century style of the day. The heroes of the Red Army surround you as you walk down the central hall of Taganskaya, built in 1950. On the Koltsevaya line, this station originally had a relief panel of Stalin surrounded by children, but even before the section was removed to create a passage, the fallen leader was replaced by imagery of a more favoured historical character: Lenin. Make sure to look up at the dome of the vestibule for the “Victory Salute” mosaic panel. 1938-construction Mayakovskaya was the first deep-level vault metro station in the world, and arguably the crown jewel on the Moscow network. Located on the Zamoskvoretskaya line, the central hall is adorned with columns in marbled limestone and shiny stainless steel, offset by a floor in grey and pink granite and white marble. Looking up, there are mosaic panels all along the ceiling created by “People’s Artist” Alexander Deyneka, called “24 Hours in the Land of the Soviets”. Located on the Arbatsko–Pokrovskaya line, Ploshchad Revolyutsii station essentially doubles as a sculpture gallery. Built in 1938, station was named after Revolution Square and has 76 bronze sculptures representing the Soviet people, glorious in past and future. Multi-coloured marble adorns the hall, which originally had a relief of Stalin before this was deemed not quite in the glorious spirit and removed. The elaborate mosaics covering the walls makes Kievskaya one of the highlights of the Moscow metro. Built in 1953, this station commemorates Russia’s union with the Ukraine, which gained independence in 1991. Located on the the Koltsevaya line, the station frescos show Ukrainians happily at work and play, surrounded by columns faced in white and grey Koelga marble. Built in 1988, Mendeleevskaya is less elaborate than many of the older stations, but make the trip anyway for the spectacular light fittings along the ceiling of the central hall. The wall plaques show atomic and molecular structures; this station was named for Dmitri Mendeleev, creator of the Periodic Table of the Elements. Located on the Serpukhovsko–Timiryazevskaya line, Mendeleevskaya is technically the same station as previously mentioned Novoslobodskaya on the Koltsevaya line; the Moscow metro system will often have multiple names for interchange stations to reflect which line you are using. Built in 1953, Kropotkinskaya is on the city’s oldest metro line: the Sokolnicheskaya line. Two rows of ten-sided column make up the elegant central hall, where white marble is lit by lamps hidden in the tops of the columns. More marble is found in the walls, while the floor is grey and pink granite. Kropotkinskaya won several awards when it was built, including at expositions in Paris and Brussels in 1937 and 1958 respectively, not to mention the Stalin prize of the USSR for architecture and construction in 1941. Komsomolskaya is where the Moscow Metro really gets its ballgown on. High, yellow-coloured ceilings are adorned with large mosaic panels, and the theme of the 1952 station is the Russians’ fight for freedom and independence. This was inspired by Stalin’s speech at the 1941 Moscow Parade, where he told dispirited World War II soldiers to remember their heroic Russian forefathers. Located on the Koltsevaya line, artist Pavel Korin chose to use mosaics after having seen in grand cathedrals how the durability of this medium meant the artwork may well last forever. Posted on 10/31/2012 by Jess. 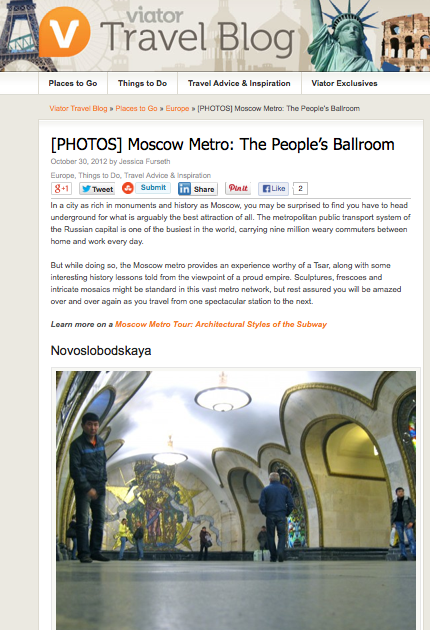 This entry was posted in Travel writing and tagged metro, moscow, travel. Bookmark the permalink.